Inspired by the Himalayan Monal Commonly known as Danfe bird. The silhouette is inspired from the figure of Danfe which consist of wings attached from the shoulder & the tail figure attached from the hip (taking the shape of abdomen of the bird) & ends at the ankle. Inner silhouette is body hugging mermaid gown of floor length. The outer silhouette is covered with feathers & made into different shapes to give the formation of bird. The major colors of the feathers are purple with the highlights of blue in the wings portion. For body position uses of blue, green, red, yellow & purple colored feathers can be seen. The front & the back designs are similar except the wings in the front are open whereas the wings in the back are closed. The color effect of the feathers is created by dyeing the real chicken feathers. After dyeing the feathers, metallic or nonmetallic acrylic colors is hand painted to give shaded & shiny metallic look as similar to real bird’s feathers. 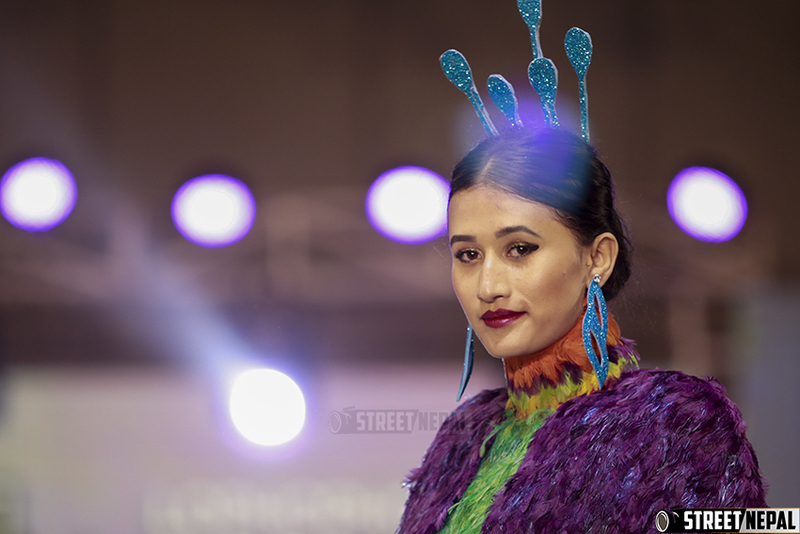 The dress consists of layered choker made with smallest of the whole feathers as accessories to match the dress. To give the bird’s complete the model’s whole look. Model is accessorized with blue dangler ear piece along with the matching make up.